Anchor historian Dave Burkhart tells the story of balladist Billy Barnes and his paean to San Francisco’s favorite libation. “The old days might not have been better,” penned Herb Caen in One Man’s San Francisco, “but they were certainly different in the nicest possible way.” The intrepid columnist was referring to “a piece of doggerel titled ‘The Ballad of Steam Beer.’” Neil Davis, owner from 1959 to 1973 of Sausalito’s No Name Bar—one of Anchor Steam’s oldest accounts—had sent the “rollicking, rolling bit of verse” to him. It was written by native son William Sanford Barnes. Born in San Francisco on September 1, 1864, Billy Barnes graduated from Harvard in 1886, returning to the city by the bay to join his father’s law practice. He was first elected District Attorney of the City and County of San Francisco in 1890. His most famous case, involving the gruesome murders of two girls at a Baptist church in 1895, is well chronicled in Virginia A. McConnell’s Sympathy for the Devil. The portly Billy, a life member of the San Francisco Press Club, was caricatured in the Chronicle in 1898 when he became Captain of Company C (Petaluma), Eighth California U.S.V. Infantry. In 1902, Billy donated 150 books to the Press Club’s library. 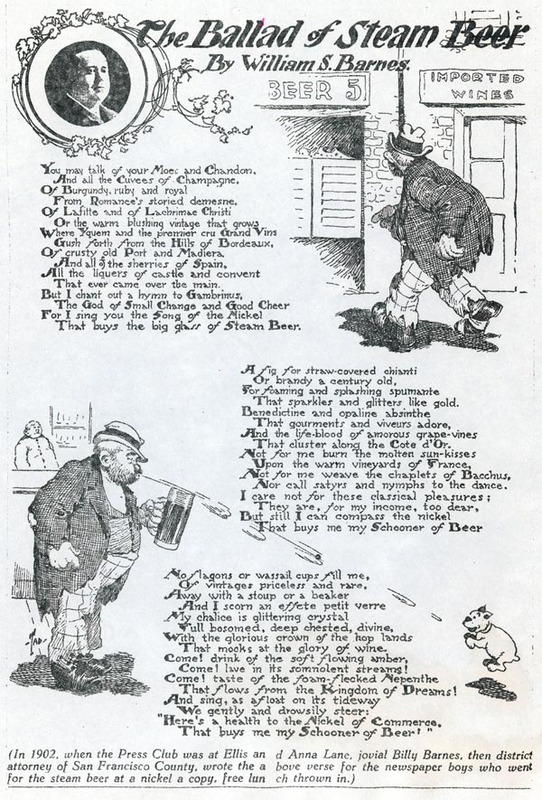 According to a copy of “The Ballad of Steam Beer” in Anchor’s archives, it was in that year that Billy penned his sudsy sonnet for the newspapermen who cheerfully ponied up a nickel for a schooner of steam beer—and a free lunch. “The Ballad of Steam Beer” was actually first published in 1897, in The Wave, a San Francisco magazine whose contributors included the legendary Benjamin Franklin (Frank) Norris (1870–1902). Ironically, the Ballad shares a page in The Wave with excerpts from the manuscript of Norris’s McTeague, the story of a steam-beer-swilling, concertina-playing, Polk Street dentist. That ever came over the main. That buys the big glass of Steam Beer. That sparkles and glitters like gold. That cluster along the Cote D’Or. Nor call Satyrs and Nymphs to the dance. That buys me my Schooner of Beer. That mocks at the glory of wine. That flows from the Kingdom of Dreams. Billy’s family (including his son Sanford, born, like Anchor Steam® Beer, in 1896) survived the 1906 San Francisco earthquake and fire. In May 1906, he shared his experiences with his Harvard classmates in a moving letter to class secretary John Henry Huddleston. He would have to wait until July 5, 1906, to have a legal “big glass of Steam Beer” in earthquake- and fire-ravaged San Francisco, which had been dry since April 18. We are all in a terrible turmoil here as yet, and are trying to feel around and discover approximately where we are at. No description that you may have read in the papers can at all equal the days and nights of horror that we have passed through as we fought to save the poor remnant of our home that survives. The recollection of the time from Wednesday to Saturday that we passed among earthquake shocks, conflagrations, falling walls, dynamite explosions and rifle shots—for many a battle was fought in the blazing streets and the bodies thrown into the flames—will remain with me until the day I die—and after. The relief furnished us by the country has been most ample and adequate—without it we would have simply starved—for had one had a million dollars in his pocket he could have bought nothing, for there was nothing to buy. So we all took to the breadline and mighty glad to get into it. Now comes the hardest time, the fitting oneself, sanely, to the changed conditions. Personally, the fire went through me in great shape. 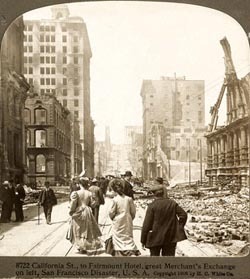 The Merchants’ Exchange, left, after the 1906 San Francisco earthquake. Photo courtesy Dave Burkhart. It destroyed the Merchants’ Exchange Building where our offices were located and everything went with it. We did not save a single paper, deed, note or anything else, either of our own or those intrusted to us by clients. The Exchange being ‘earthquake and fire-proof,’ we carried no insurance like the other tenants. Later in the day my house burned. We saved a gripful of foolish things there and the rest of it went. Thank God, however, my wife and boy were unharmed and are now safely at the farm in the Santa Clara Valley, some 45 miles from here. Apropos of that to show you the conditions that prevailed on the day after the shake, when Mrs. Barnes started for the country it took her twenty-five hours to make the trip we make in ordinary times, in an hour and a half. I write this of myself because you asked me to and at the risk of being a bore. I have not seen any of our fellows since the ‘troubles’ but you may rest assured that they are all right physically, for the lists of killed wounded and missing are now complete and no man of ours is among them. I greatly fear I shall be deprived of the pleasure and privilege of coming to our 20th [reunion], for with me, as with so many others, the 18th of April swept away the fruits, such as they were, of twenty years of hard work, and I have to begin again. But we are unterrified and hopeful and will cut our coats according to our cloth. On the day before I had written a letter to Gordon Woodbury at Manchester, telling him that I was coming on and was looking forward so much to seeing the boys. Well, man proposes and something else disposes. Nevertheless, my dear fellow, I trust that you will give the class an affectionate greeting from me. If there is one fine, big drink to be got in this one busted town on the day and hour of our dinner, I will connect with it and drink your health, collectively and separately. 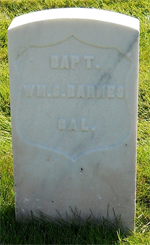 Billy Barnes died on March 13, 1910, and is buried in the San Francisco National Cemetery at the Presidio. Join us in raising a “big glass of Steam Beer” to this poetic beer-ister!